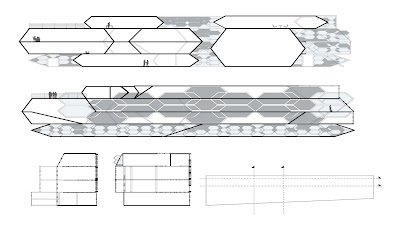 Swarm Theory and Transformative Processes in Design: Allison_plans, sections, final. Plans; showing the specifics of the structure. The skin pattern creates a solid mullion and the 'open'/'closed' component of the skin creates a window. The dotted lined notate the overhang of the oblique walls. The structure pattern overlaid on the floor creates a glass tiling system, as shown previous here. 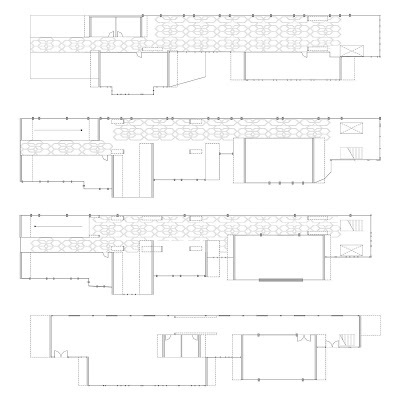 Sections; highlighting the overlapping program, structural system and 'open'/'closed' skin system.